President Lawrence S. Bacow—on an Asian itinerary including stops in Hong Kong, Beijing, Shanghai, and Tokyo—delivered an address last night at Peking University titled “The Pursuit of Truth and the Mission of the University.” His visit comes at a time of sharp strategic and trade differences between the United States and China, and of increased control of discourse and dissent within the People’s Republic. The Chinese government is wary of landmark anniversaries in the country’s modern history that may serve as reminders of past unrest and as prompts to air disagreement with its current directions—among them: the student protests known as the May 4 incident and a subsequent movement toward political change (1919); the founding of the People’s Republic (1949); the uprising in Tibet, its suppression, and the Dalai Lama’s flight to India (1959); and the brutal suppression of pro-democracy protests at Tiananmen Square (1989). Updated March 20, 2019, 1:45 p.m., to report on the meeting between Chinese President Xi Jinping and President Bacow; see below. It is a special honor for me to visit you as you approach…the centennial of the May Fourth Movement, a proud moment in your history that demonstrated to the world a deep commitment on the part of young Chinese to the pursuit of truth—and a deep understanding of the power of truth to shape the future. Even now, President Cai Yuanpei speaks to us. “Universities are places for grand learning,” he said. “They are grand because they follow the general principle of free thought.” Under his visionary leadership, tremendous intellectual exploration and dramatic social change were unleashed. In his magisterial The Search for Modern China (1990), a standard reference, Jonathan D. Spence described the student protests that erupted on May 4, 1919, with a demonstration at Tiananmen Square and a march on foreign legations—motivated in part by terms of the Versailles conference ending World War I that were favorable to Japan and unfavorable to China. It gave rise to a broad-based, national student union; ties to merchants, businessmen, and labor organizations; an upwelling of reformist publications; and broad debate about the country’s future, pointing toward “a rejuvenated, unified China that would have the means to cope” with predatory warlords, exploitative feudal landlords, and foreign imperialism. Many of modern China’s notions about nationalism, liberalism, and communism stem from this period and the May Fourth Movement, broadly defined. The modern, Communist Party-led state of course endorses the goal of a strong, unified China that can control its own fate and loom large in world affairs. But it also presumes that the wisdom to chart that course lies firmly, and exclusively, within the party itself—and so has little sympathy for the broad-mindedness and tolerance of diverse perspectives that are associated with Cai Yuanpei. 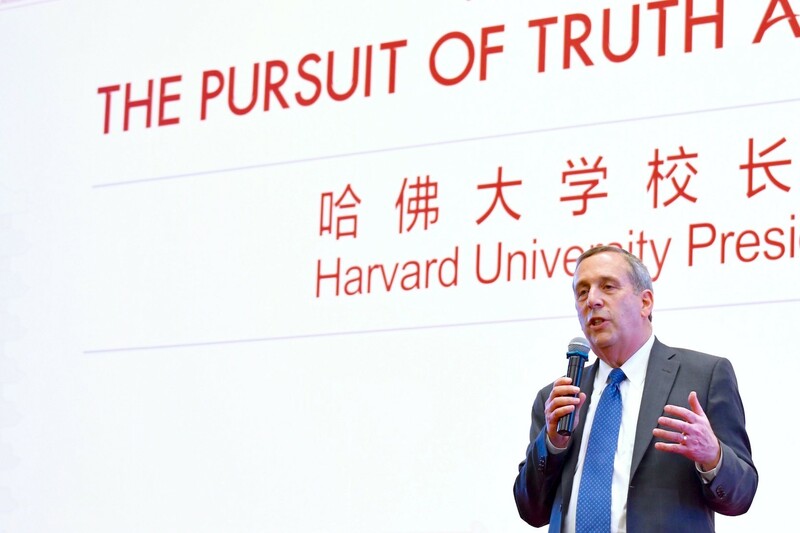 It was the latter theme that Bacow chose to emphasize at the very beginning of his remarks, in a way that could not have been missed, or misunderstood, by his audience at the Peking University of 2019. His audience would also know about Cai Yuanpei’s advocacy for universities’ institutional autonomy (not the norm when he became the young republic’s education minister), and for scholarship and freedom of expression within the academy unconstrained by religious or political limits. Whatever their meaning within the context of the contemporary People’s Republic, of course, these ideas also lie at the heart of Bacow’s own beliefs about the mission of the university—the overarching theme of his address. Harvard and Beida share a deep and enduring commitment to higher education. We enjoy many strong connections and collaborations among our students and our faculty, who are generating knowledge that will change the world for the better—be it through art and architecture, through medicine and public health, or through engineering and environmental science. We should remember that Cai Yuanpei not only led this university, but also helped to found the Academia Sinica, the Shanghai Conservatory of Music, and the China Academy of Art. His example reminds us of the power of both the arts and the sciences to elevate the human spirit and improve the human condition. Bacow presented two striking examples of scholarly openness and exchanges across borders—both threatened by China’s control of expression and by U.S. policies restricting migration. I recall being a young faculty member at MIT in the late 1970s and witnessing a historic visit from a delegation of visiting scholars from China. Long separation had not weakened the bonds of affection among students and their teachers or faculty and their colleagues, some of whom had not seen each other for decades. They greeted one another as if they had been apart for only a short while and soon found themselves engaged again in areas of common interest. It was powerful evidence to me that universities can be sources of strength through tough economic, political, and social times. I am also reminded of the first Pugwash Conference on Science and World Affairs. In 1957, as Cold War tensions mounted, 22 of the world’s eminent scientists gathered in Nova Scotia to discuss the development of thermonuclear weapons and the threat their use posed to civilization. Their collective work helped to pave the way for the Partial Test Ban Treaty of 1963 and the Non-Proliferation Treaty of 1968, among other consequential agreements. There were 22 attendees—seven from the United States, three from the Soviet Union, three from Japan, two from the United Kingdom, two from Canada, and one each from Australia, Austria, China, France, and Poland. Professor Zhou Peiyuan, a physicist and the sole Chinese member of the group, later became president of this great institution and, in 1978, led a delegation that arranged for scholarly exchange between China and the United States. We owe thanks to people like Professor Zhou Peiyuan for their farsighted and courageous leadership and for putting peace and mutual understanding above all other considerations. Given current conditions in China, particularly during this year of politically charged anniversaries, many members of the Peking University community may recognize the principles Bacow elaborated more than they can now enjoy their own scope for local action, even on their country’s campuses. Ötkür, a renowned Uyghur poet, novelist, and translator, graduated from Xinjiang University. Again, Bacow’s audience likely took in both the content of the verse, and its context: the United States and other nations have been increasingly critical of China’s wide detentions of the Muslim Uyghurs in the far western Xinjiang region. It is unknown whether Bacow met, or is scheduled to meet, with government officials during his time in China. It seems an era ago—a more open, and perhaps hopeful, time in Xi Jinping’s leadership of the country—when he and Drew Faust conferred during her visit in 2015. In the more difficult conditions prevailing now, President Bacow chose to focus on the foundational conditions for research and scholarship within universities as the basis for continued ties and progress. He alluded carefully but unmistakably toward a period of intellectual opening and freedom a century ago that shaped modern China, and to the severe challenges that such work can face within that country, and around the world, today. Read the text of President Bacow’s address here.